The Weinstein Company’s exploration of outré business practices continues with Gold, which, like its sibling in commerce The Founder, is receiving an awards-qualifying Los Angeles run ahead of a wide release in January. 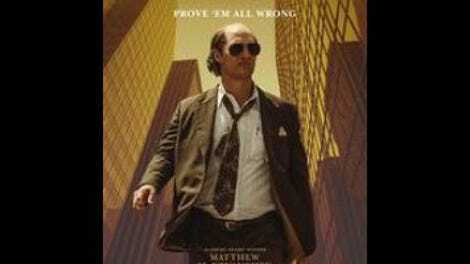 Comparison between the two films isn’t entirely fair; Kenny Wells (Matthew McConaughey) is less famous than McDonald’s wheeler-dealer Ray Kroc, in large part because he is made up. Gold is based on a true mining-company story from Canada in the mid-’90s, which has been transposed to the United States in 1988, with an apparently fictionalized cast of characters. It’s just as well: While it’s not quite a signature McConaughey role, after watching Wells for a couple of hours, it’s hard to picture anyone else animating him, on screen or in real life. The movie includes narration, as so many Weinstein-produced films do, but McConaughey makes the exposition dump sound weirder, more urgent and insinuating, like he’s telling the audience his story in a smoky bar without breaking eye contact. A smoky bar is indeed where Wells does a lot of his business: Early in the movie, his mining company loses its office space and starts operating out of a local watering hole. Undaunted, ever-hustling Wells at least gets to spend some extra time with his girlfriend, Kay (Bryce Dallas Howard), who works both at the bar and a furniture store, helping to make their modest ends meet. 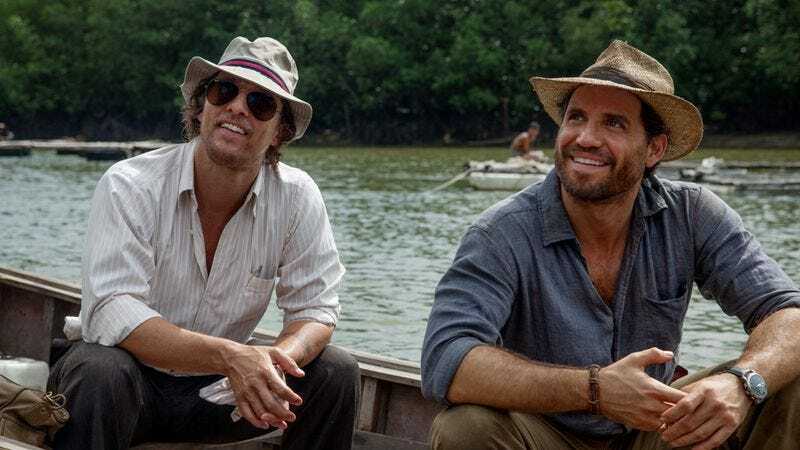 With receding hair and a little more bulk, McConaughey sometimes resembles his True Detective partner, Woody Harrelson, but he gets a McConaughey-style gleam in his eye when he hears about a possible literal goldmine in the Indonesian jungle. Partnering with Michael Acosta (Edgar Ramírez), he sets off to find what he hopes will be a company-saving cache of precious metal. After some major setbacks, he wakes from a self-described “malarial haze” to some good news from Acosta: They’ve done it. They’ve found gold. Once Wells strikes it rich, both McConaughey and the movie get a substantial energy boost. Director Stephen Gaghan (writer of Traffic and writer-director of Syriana) treats the cavalcade of newfound wealth like the spoils of a drug narrative, with some split-screen mining-production montages, caffeinated push-ins, and recurring bass patter on the score that makes it sound poised to break into “White Lines” at any moment. (It never does, but well-chosen and less overused ’80s songs by the Pixies, New Order, and Joy Division pick up the slack). McConaughey, meanwhile, swans around, indulging a series of rants and raves about various financial offers for his company and/or personal slights contained therein. Wells’ self-satisfaction derives less from wealth than the knowledge that he might be considered a truly excellent miner (a strange notion, but the actor sells it). It turns out that he can adapt to both the hubris of great success and the sloppiness of bottoming out with equally alarming speed, and he gets plenty of opportunities to do both. This may be part of the movie’s joke, but little of Gold seems pitched for dark laughs, so the sheer number of rags/riches toggles becomes dizzying, and not especially enlightening. The movie issues the galvanizing insight that wild amounts of money and success do not make people smarter or humbler. Where Gold falters more egregiously, though, is in its ultimate insistence that this story is largely about the relationships Wells has with his love, Kay, and his buddy Acosta. Howard does well with what she’s given, but she barely has time to plant herself in any big scenes. Her biggest moment, a crucial blowup between the happy couple, has a long fuse but leads to a damp fizzle. Ramírez, meanwhile, underplays, which ultimately makes sense for his character, but renders Acosta something of a blank for much of the running time. Gold is fitfully entertaining, but for a movie that gives itself license to go bigger and weirder than real life, its imagination for excess runs out whenever it isn’t focused intently on its star.